Are you looking for ways to style up your residential property or commercial property? If yes, Carroll Awning Company highly recommends installing retractable screen doors. This article will provide you information on the advantages retractable screen doors can provide you as a homeowner or business owner. Retractable screen doors are made from flexible screen mesh and designed to roll up and down to provide you simultaneously better indoor and outdoor comfort and functionality. Here at Carroll Awning Company our retractable screens are custom made to fit your doors, windows and screen porches perfectly. Even when the retractable screens are rolled down, you won’t miss out on the great view of your landscape because the screens provide exceptionally sharp and brilliant outlooks. The best part about retractable screens are the enjoyable access to the great outdoors without pests invading your home or business. So you will never have to sacrifice great protection as you enjoy fresh, free flowing air. 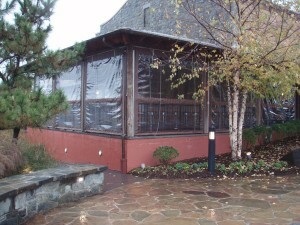 Every Carroll Awning Company retractable screen will provide smooth motion for screen openings and closings. And more retractable screen usage. Motorized roll screens are beneficial because they provide good privacy, keep pests out and allow you to treasure your days while adding new dimensions to your residential property or your commercial business.